Sambo had just turned 1 & I had been looking for a playmate for some time for him. To me Sam was just the best looking dog out & I wanted his mate to have similar markings so I was quite selective in choosing the right friend for him..( not having the internet to help back then). Finally I got a call & Jessie sounded the right one. We moved into our Kingsland property 3 months after we got Jessie & it is from then on that she slept on my bed!! In the summer when she got too hot she would sleep underneath & every winter I would get squashed between her & Greg. Jessie was a water baby supreme. She was the sort of dog that would find water in the dessert. She loved chasing the hose. We would take her & Sambo to the beach at Point Chev regularly and Sam would chase the gulls & Jessie would chase him and dive into the water. Many times down at Ohope in the harbour or at the lakes Jessie would swim & I would hold on to her and she would pull me along.. cool times. When we went away on holiday Jessie would stay with my parents. My father adored her and it was a great sight to see Jessie sitting looking out the passenger window as they drove along. Their love was somewhat stretched the day they went to friends for lunch and told to bring Jessie with them, they had a few acres & she could run around.. well she sure did & went straight into the smelly sheep trough!!! One evening we had taken them to the beach quite late so she was too wet to sleep on the bed.. Well she wasn’t having a bar of that so she just jumped up & climbed in through the window!!! She knew it wasn’t perhaps the wisest of moves so she crept in & slept under the bed.. I heard a low snoring during the night & was surprised I could hear her through the outside wall!!! A huge pile of sand under the bed in the morning gave her away!! The other VERY memorable trick was when we had gone up the road for no more than an hour. When we arrived back home there was Jessie Bear 6 months old lying in the middle of the floor with the cat door around her middle & glass everywhere.. I got such a fright but once I found her to be alright, my next panic was going to be the reaction she would get when Greg walked in!! From that day on we had a wooden dog door!!! 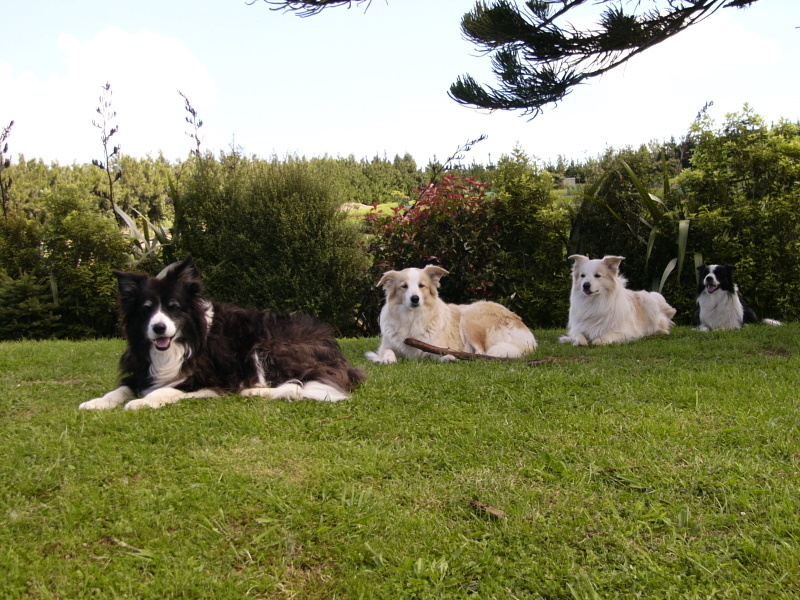 The dogs loved our move to Invercargill. The beautiful Oreti beach was just perfect for Jessie. 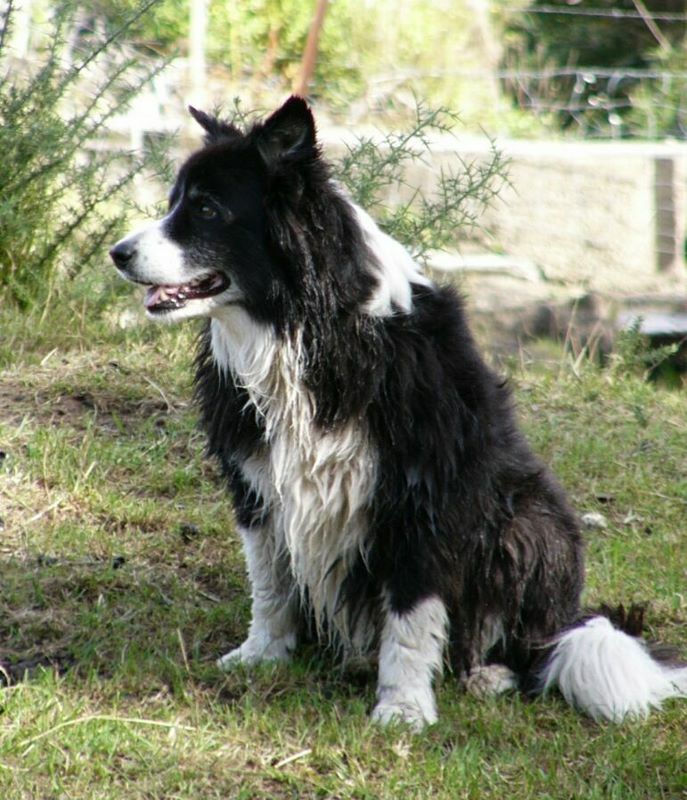 We attempted to mate Jessie & Sambo but were unsuccessful so found another boy for Jessie & in November 2000 at the age of 5 Jessie had a beautiful litter of black & red pups. She really was not impressed with their arrival and her bond with me got stronger again and she insisted I be a full time nanny. If she had to feed the kids then I had to be with her too (to hold her down!!) From being the dog that would sleep only inches away from Jessie bear would be no where to be found. Her babies would start crying in the night & I would go out and find Jessie at the furtherest part of our property!!! the mother from Hell we called her!! Once I took over the feeding completely she was quite happy to come back in and play with them. Jessie has always loved to play and even up to 6 months ago she would do the jump stance to Tyler. She was a puppy at heart for most of her life. We kept two of her pups Tyler and Jasper who will turn 9 this November. In March 2001 we moved back up North, now with 4 dogs and minus my beautiful cat Ben who died at 18 years of age. Jessie stayed with my parents in Rotorua when we had her fixed and recovered from her operation while we lived at Papamoa & looked around for a place to buy. We moved onto our block of land at the end of that year and it was sold to us though Jessie Bears eyes. When we saw the beautiful creek that runs through it we both said Ohh Jessie will love this and she most certainly has. It has been a fantastic place to bring up dogs and not without a few disasters to go with it. Jessie got a bone stuck in her stomach and had half her stomach removed. 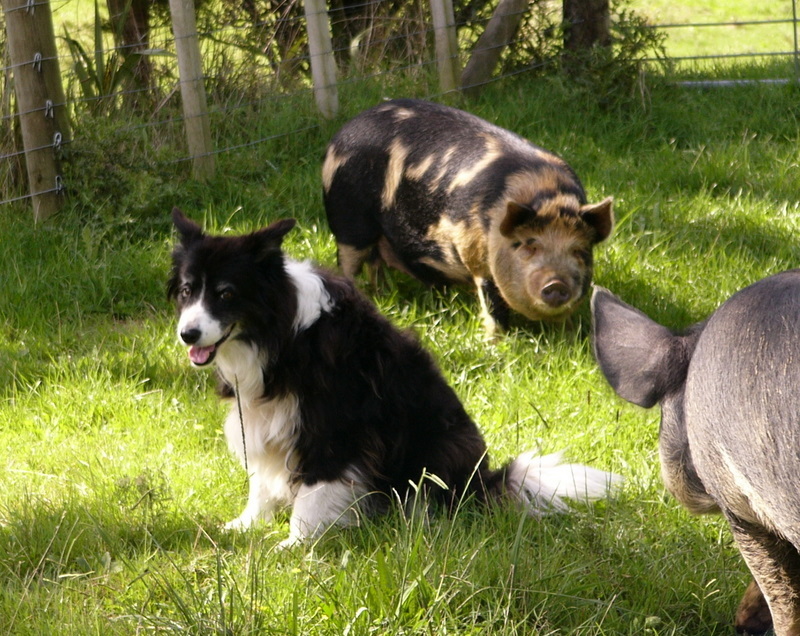 (Our fault for giving her a cooked bone) And then the donkey we got kicked her in the stomach & ruptured her liver.. he had hidden in the bush and ran down after her.. Jessie just never gave him a thought and.. wham..we got rid of him after that. She has been a great little ratter and possum finder. The summer of 2007 Jessie started to slow down and she found the heat quite a strain and I would have to leave her behind on our longer walks. The winter time she perked up and then this last summer she slowed down again. She was unable to get up on the bed so we had a chair there for her and when she became unable to manage that.. she would cry every night to get me to lift her up. Her old age was setting in but she still had a huge spark & the same twinkle in her eye. When we moved into our house last August I decided it was time she slept on her own bed as my sleep was just getting too disturbed with her. She actually accepted that really well & slept in the camp bed next to me. Then the last few months she found it too difficult to get up our stairs so every night she would cry and we would have to carry her up. She could down Ok so would go out to the toilet and then insist on us getting her back!! Some nights more than once!! We had her on medication to ease her old joints but she got very frail and quite wobbly. She then went off her food and the spark went out of her eyes. My very dear old friend didn’t ask to come back up the stairs and wanted to sleep. She is going to leave a huge hole in our lives. Her head would go from side to side when you talked to her. We won’t miss her barking but she was a dog that totally ruled our life. A truly faithful friend. She is what all trainers would call a nightmare!! She would sleep on our furniture and my bed, she would ALWAYS be sitting in the doorway so we would have to step over her. She was desperate not to miss out on anything & she never has.. I have selected some of my favourite photos of her ( not counting the pre-digital days). It was hard enough to narrow these down. Some of her when Sam was still alive 5 years ago and today swimming with her Grand-daughter Trinity who taken over her love of the water. From the 7 children Jessie had we have produced 53 Tylerwild grand-children to date. Jessie Bear my Bubsy will always be in my doorway. She was always such a happy dog. I hope if you have one of her progeny you get as much pleasure out of them as she has given me.